The United States Congress finally issued physical standard weights, measures, and balances to each of United States in the 1840s, and the individual states shortly thereafter adopted these as official state standards and directed copies to be made and distributed to their various state jurisdictions to the end such that there would be conformity throughout the country. 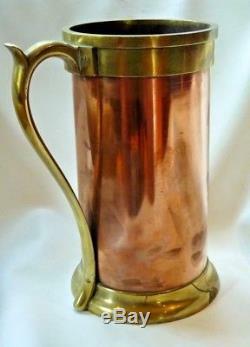 Ohio officially adopted the Federal standards in an Act of February 21, 1846, directing that copies of the [all-brass Federal] gallon liquid capactity measure be of one sixteenth inch copper with brass rim and handle. 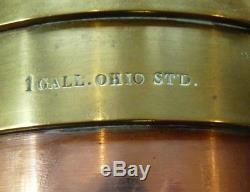 This example--in excellent, undamaged condition--generally conforms to Ohio's 1846 legal specifications, having a brass handle, copper body, and reinforced brass rim and base. Whoever it was, he/they produced what is arguably the most elegant of all mid-1800s American state standard liquid capacity measures. No damage, no repairs, no apologies. 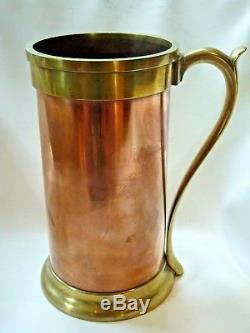 A near-miint example of mid-1800s American metrological coppersmithing at its finest! The item "Magnificent American 1 Gallon Ohio Standard Measure in Copper and Brass, ca. 1847" is in sale since Monday, August 20, 2018. 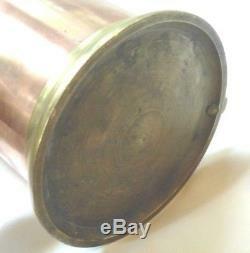 This item is in the category "Collectibles\Metalware\Copper". The seller is "ema5" and is located in Lexington, Massachusetts. This item can be shipped to United States, United Kingdom, Denmark, Romania, Slovakia, Bulgaria, Czech republic, Finland, Hungary, Latvia, Lithuania, Malta, Estonia, Australia, Greece, Portugal, Cyprus, Slovenia, Japan, China, Sweden, South Korea, Indonesia, Thailand, Belgium, France, Hong Kong, Ireland, Netherlands, Poland, Spain, Italy, Germany, Austria, Israel, Mexico, New Zealand, Singapore, Switzerland, Norway, Saudi arabia, Ukraine, United arab emirates, Qatar, Kuwait, Bahrain, Croatia, Malaysia, Colombia, Panama, Jamaica, Barbados, Bangladesh, Bermuda, Brunei darussalam, Bolivia, Ecuador, Egypt, French guiana, Guernsey, Gibraltar, Guadeloupe, Iceland, Jersey, Jordan, Cambodia, Cayman islands, Liechtenstein, Sri lanka, Luxembourg, Monaco, Macao, Martinique, Maldives, Nicaragua, Oman, Pakistan, Paraguay, Reunion.